"What are YOU doing to HELP?" July 28, 2014 marked the centennial of the outbreak of World War I. Bryn Mawr Special Collections is fortunate to have an extensive amount of materials documenting the War’s impact on the College’s students and alumnae. One of those alumnae, Margaret Hall, Bryn Mawr College Class of 1899, volunteered at a French Red Cross camp during 1918-19 and documented her time there in letters, diary entries, and photographs. 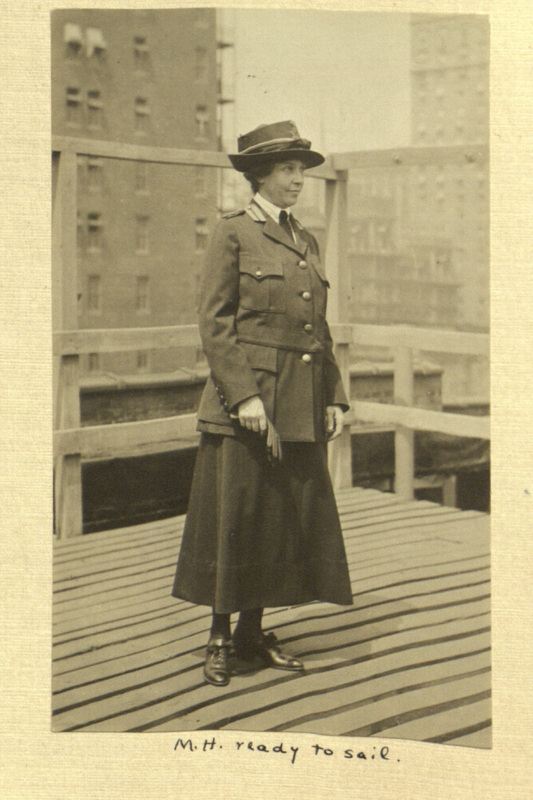 Upon returning to America, Hall compiled her letters and photographs into a bound manuscript, titled "Letters and Photographs from the Battle Country, 1918-1919". Only a few known copies of the manuscript survive in library collections today; the Massachusets Historical Society recently published their copy of Hall’s narrative as, Letters and Photographs from the Battle Country: The World War I Memoir of Margaret Hall, edited by Margaret R. Higonnet with Susan Solomon. The aim of this project is to bring the rich history of the Great War to life through photographs, original artwork, posters, newspapers and letters while using Hall's riveting, first-hand account as a focal point. There were many other Mawrters that went abroad in support of the war effort and their stories will be told here as well. Bryn Mawr students at home, with strong encouragement from President M. Carey Thomas, started a Red Cross group and patriotic farm worked by students. Enjoy traveling back in time to explore the lives of some extraordinary Bryn Mawr women. This exhibit was created during the summer of 2014 by Elizabeth Reilly, Bryn Mawr College Class of 2014 with the help of Marianne Hansen, the Curator for Rare Books and Manuscripts and Evan McGonagill, the Assistant Director of the Albert M. Greenfield Digital Center for the History of Women's Education.